In partnership with Humboldt Green Week 2018, Northcoast Horticulture Supply is having our 13th Annual Customer Appreciation Event, Vendor Dayz! Shop up to 50% off horticulture supplies at all store locations during our big event. From 10 am to 5 pm Wednesday, April 18th through Sunday, April 22nd NHS will have around 30 Vendors at our stores educating gardeners, showcasing new products and giving away FREE samples and helping Farmers Have Fun In The Garden! In celebration of Earth Day on Sunday, April 22nd, we will have FREE flower, herb and veggie starts while supplies last to give away to our customers. Vendor Dayz is fun for the whole family! 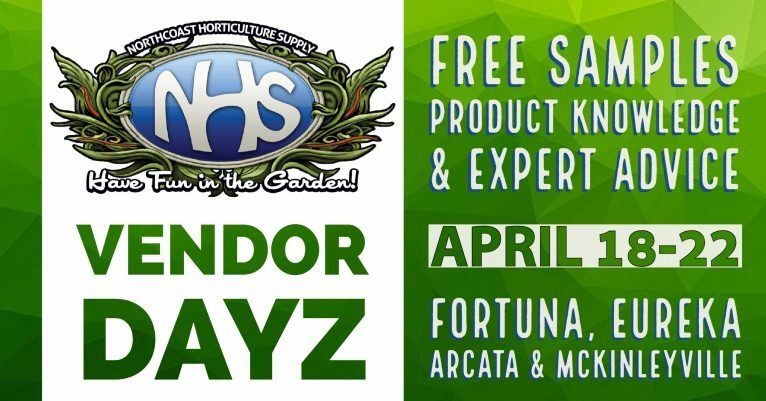 We’ll see you out at NHS Vendor Dayz April 18th through the 22nd in McKinleyville, Arcata, Eureka and Fortuna.